OK, time to post another message. Here are rough versions of my sketches (with line of action drawn) for session 102. I selected 7th one for my stu pose but I am not putting it up here. Instead from now on I will only put my extra work and progress reels to my blog which will save me from doing a lot of uploads:) Anyway, I know pose 1 is not good and realistic enough because I did not want to deal with rope tensions and I did not have enough time to refine it (time to go to bed:). The other one, pose 4 can also get better with some minor modifications. 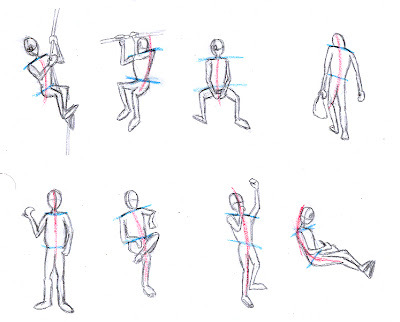 I found that when the poses involve sense of weight (like bag in 4) or forces affecting the body shape(1), posing becomes much harder than doing even very fancy looking, eye pleasing poses without noteworthy forces. So I should better work on those more.